Is this you? You don’t know where to start on your opening statement? 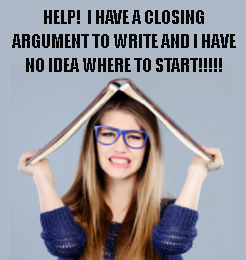 That is a common feeling for students having to write a mock trial opening statement or closing argument. Suddenly you wish you paid more attention when your parents were watching Law & Order reruns. Well, there is help for you. On my main website, I have provided information about how to write openings and closing for mock trial. It will help get you started and get you thinking about what you need for your particular mock trial scenario. It should provide guidance particularly on mock trial scenarios that involve criminal cases as opposed to civil. If you have any suggestions of feedback, leave me a comment below. As always, thank you for visiting my blog, and good luck with you mock trial!